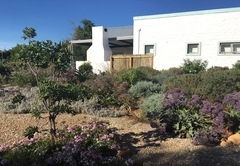 Obiekwa Country House is a highly recommended property providing self catering in Riebeek Kasteel for up to 6 guests visiting the Swartland region. 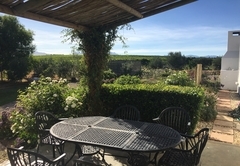 Obiekwa Country House is located in the picturesque and quaint village of Riebeek Kasteel in the Swartland, with its wine estates, gourmet restaurants, festivals and wedding venues. 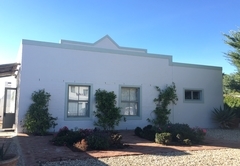 The country house is set in a large garden with expansive lawns and garden beds, and is located in a quiet cul-de-sac on the edge of Riebeek Kasteel village. There is a friendly pub a few hundred yards away, and the village square is a fifteen-minute walk through the picturesque streets. 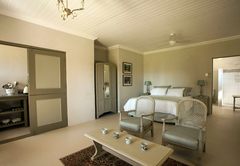 Obiekwa Country House sleeps up to six guests in three large luxury bedrooms, each with its own distinctive décor and furnishings. 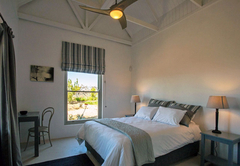 The main bedroom has a hi-volume ceiling, remote-control fan and dimmer, en suite shower and a view through the big sash window across the vineyard to the mountains. 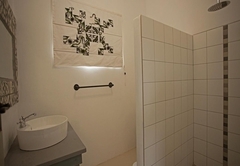 The second bedroom has a remote-control ceiling fan and en suite shower and bath (useful for families with younger children). 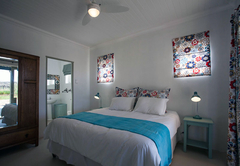 The third bedroom is largest of all and can be accessible from the main house and also opens onto it's own braai and patio. 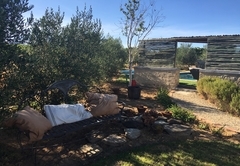 All the bedrooms open into an open-plan living and dining area, with comfortable country-style armchairs, sofa and 6-seater dining room table. 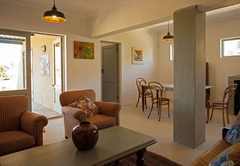 The self-catering kitchen has an electric stove, big fridge, all crockery and cutlery. 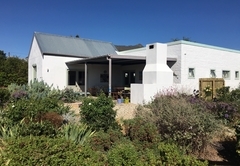 The living area opens onto a large covered patio with barbecue, and looks over a fynbos and succulent garden to the vines. 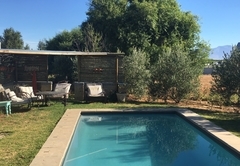 Obiekwa Country House also offers a swimming pool at the bottom of the garden near the vines to cool down on warm summer days. Off-street parking is provided for several cars. 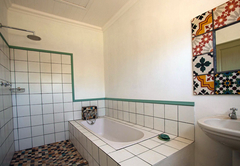 Obiekwa Country House in Riebeek Kasteel is a very pretty house, decorated tastefully with a wonderful view of the surrounding vineyards. It has good security and you can walk into town and to local restaurants. 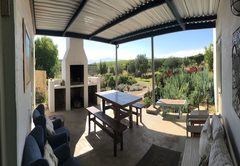 We had a memorable weekend in the quaint little town and recommend the accommodation. Response timeObiekwa Country House typically responds to requests in 5-10 minutes.